Christmas is a magical time, for children and adults. 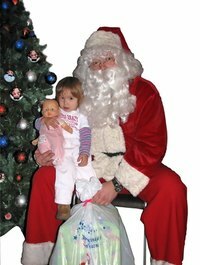 If you are looking for a way to make Christmas really special this year, why not have Santa Claus pay your kids a visit? You can make a Santa Claus suit inexpensively that can be used for years to come. With a trip to a local fabric and craft store, you can create a Santa suit in a couple of hours, and create memories for your children that last for years. Cut the cuffs off the sweatshirt and pants using scissors. The cuffs are the tapered end of the sleeves and pants that cover the wrist and ankles. Measure the bottom of the arms and legs where the cuffs were cut off. Measure and cut the faux white fur the same measurement as the arm and leg measurement. Glue the faux white fur cut in Step 2 to the bottom of the arms and legs. Squeeze a line of glue on the back middle of the fur and press the fur down on the very bottom of the arms and legs. You should have some fur hanging off the sweatsuit and some covering it. Measure the bottom of the sweatshirt and cut more fur to fit the measurement. Glue the faux fur to the bottom edge of the sweatshirt just as you did with the arms and legs in Step 4. Measure the neck of the sweatshirt and cut the faux fur to match. Glue the fur around the neck, but this time squeeze the hot glue on the outer edge of the fur and press the fur down to the rim of the neck. There should be no fur hanging off the collar, the fur should be sitting in the middle of the neck and outermost part of the shoulders. Measure the very middle of the front of the sweatshirt vertically, or from the neck of the sweatshirt to the bottom. Cut a piece of fur to fit, and glue the fur directly in the middle of the sweatshirt. Measure the mid-section of the sweat shirt to create Santa’s belt. Cut the faux leather in a thin strip, no more than four inches in width, and cut the leather to the same length you measure. Attach the belt clip to the leather to complete Santa’s belt. Stuff the Santa suit with anything fluffy to get a nice, round belly when someone is wearing the Santa suit. Add a beard, glasses and boots to complete the Santa Claus look.